A Cross Country adventure to Pikes Peak in a Grob 103. After passing my oral and practical exams, I wanted to celebrate with a nice long flight. Pikes Peak, 14,110' high seemed the perfect choice at 25 NM away. Read a detailed story which accompanies these pictures by clicking the Soaring Stories link. Getting ready to fly in the Grob 103. On tow with our destination in sight. Typical view below as we thermalled. Starting to look much closer. We can now see the trestle train tracks. We arrive slightly low and slope soar the face. As we work our way over the summit, the train works it's way up too. One last wave goodbye before we head home. Looking towards home, it sure looks far away! Turning base to runway 1-1, what a comfort to be home. 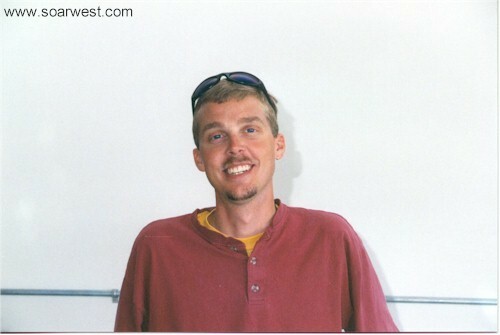 These picture were taken when visiting Peak Soaring in August of 1998 to take the practical exams for my Glider Certificate. Clouds had lennies as we drove into Canon City. They grew and shrank as we watched. A nice stack over a solid CU. Dean Baird my inspector and Dale his inspector. David Lane pulling the PW-5 home after a flight. David had a great time in the PW-5. The PW-5 on tow, it gets off in a hurry. At mid field it's already doing well. By the time they pull away their really high. 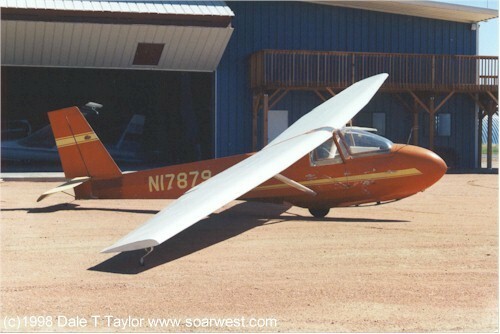 The Peak Soaring tow plane we used. A powered DG flew in and paid us a visit. 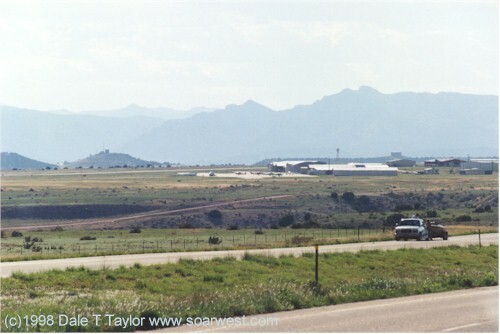 During a recent family vacation, we took a few days and stayed in Canon City (pronounced Canyon) just west of the Fremont County Airport where Peak soaring is based. I took some lessons getting ready for my practical flight exam. It was a very fun and enjoyable trip. Driving through Utah and Colorado during our trip was incredible... everwhere we looked, it seemed you could soar forever. The clouds at Utah's Dinosour Natl Monument (near Vernal Utah) were beautiful. The clouds we saw driving across Eastern Utah surely had 1000k potential! 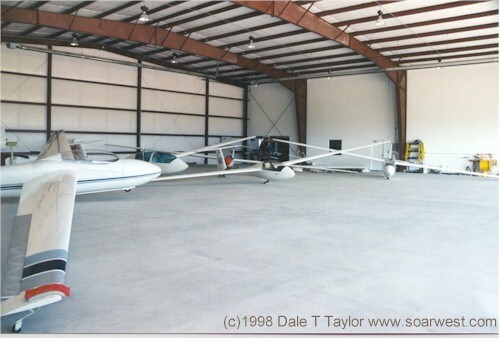 The Peak Soaring Hanger at the airport. The runway is behind me or South. 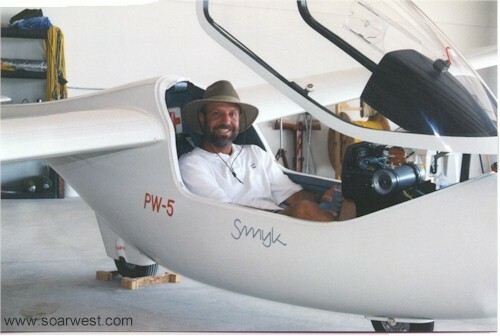 Inside I met John Duprey the owner/operator of Peak Soaring. 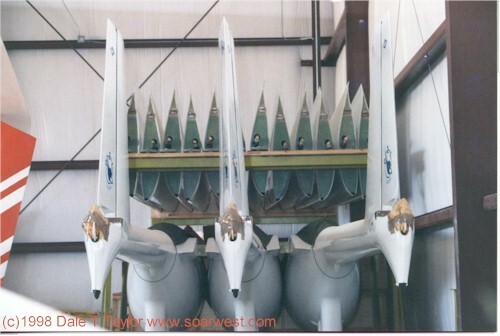 Inside the hanger there's a 2-33, a 2-32, a Grob 103, a PW-5, a LS-3, a Jantar Std and 2 Pawnee tow planes! Keith Butler my very able instructor. He does a great job. The Schweitzer 2-33 used for lessons. I happily flew my first over 1 hour flight in this glider! 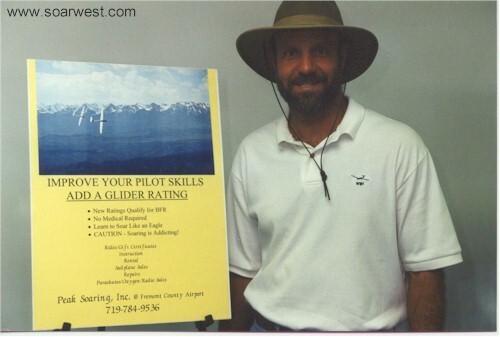 John the PW-5 dealer, showing off a great looking glider. 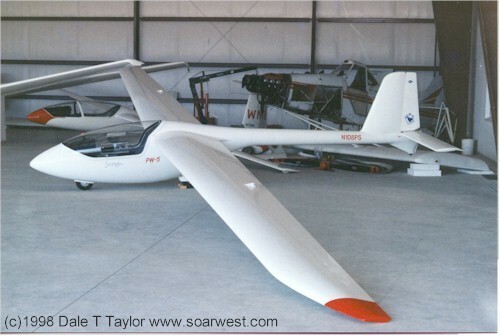 The PW-5 that you can rent at Peak Soaring. I have to say it's beautiful. 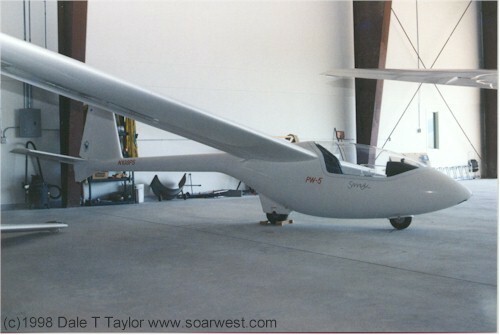 Another view of the PW-5. These are a few brand new PW-5's waiting for their new owners! This is a sight I sure would love to see in my garage! Several lucky people will enjoy these. After my afternoon free flights I had plenty of time to tour the area with my family. My wife got a rest from travelling, my kids swam all day and I got to fly, what a great vacation!!! 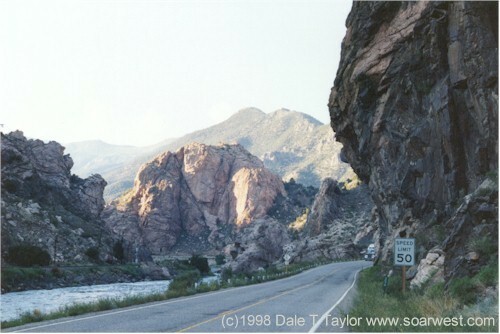 An interesting rock outcropping on Hwy 50 a few miles West of Canon City and the airport. This page was updated Monday, June 14, 2004. 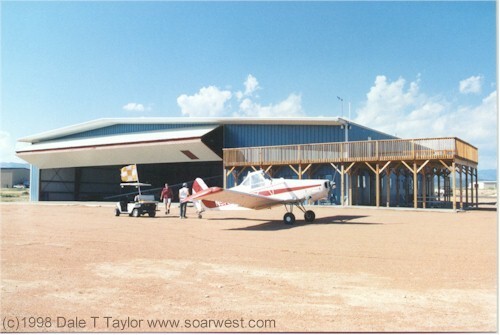 �98,99,2000&01 Dale Taylor, soarwest.com, contact via email.